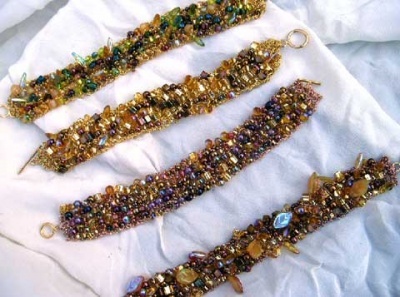 The Bead Soup Bracelet idea lends itself to so many options that it is a true joy to create. 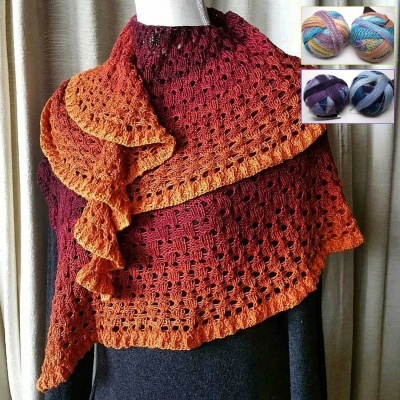 One can "play" with all sorts of looks, each as joyful as the next...and have a great time knitting it. We are offering here a Bead Soup in golden beads -- there will be triangulars and megatamas and 11/0s and 6/0s and 3/0s and 8/0s and daggers and leaves and drops in all of them. We have threads of different hues of gold, with additons of subtle highlights and we will choose one to go with your kit. If you have a strong preference, let us know, but honestly all of these capture something special. The kit has a great mix of roughly 35 grams of beads in mainly golden colorways including topaz and silver lined gold as well as the more metallic ones that mirror real gold (and some of them actually do contain some precious metals in their make-up). There are many great looks possible -- we include extra beads of all types and you can emphasize one over another if you so choose. The photograph gives some ideas.